Students have many different reasons to try out Martial Arts. We love hearing and getting to know our students perspectives & reviews for K2 Martial Arts in Ottawa. Here’s Pat Brooks Story: “My K2 story began almost ten years ago when my friend Jeff approached me and asked if I’d like to join Therien Martial Arts with him at the Parkdale DoJo. I’d done some Tae Kwon Do ten years earlier and that experience fizzled out at my orange belt. It just wasn’t “doing it” for me. 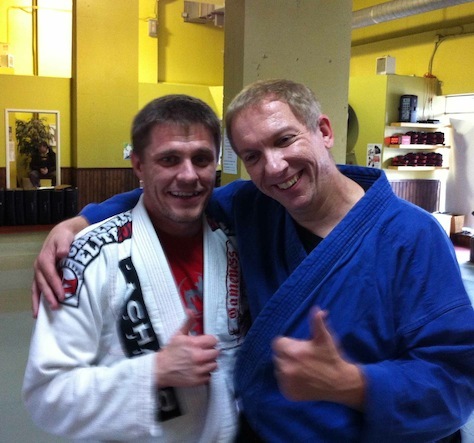 I agreed to give Jiu-Jitsu a try and to my surprise the method of teaching was completely different. Instead of memorizing and performing increasingly long katas in a stressful environment, I experienced friendly, patient and knowledgable Sensei in every class. Over the next five years I worked with Sensei Scott, Sensei Aksell and Sensei Chris to name a few, until I reached my brown belt. Then I hit a slump. I was laid off from my job and created a contracting company and started working long hours. My martial arts attendance dropped to zero due to a variety of factors, but basically I think I was just punishing myself and feeling somewhat depressed. Over the next year I spent all my time getting my business stable and I didn’t spend much time or thought on my physical well being. Now, several years later, I’m very grateful for that chance meeting. I had forgotten all the benefits of adopting a life style which includes the martial arts. Not only have I gained the fitness benefits; increased endurance, weight-loss, increased stamina and better balance, but at K2 I’ve also gain self-confidence and other character-building life skills in balance with my physical fitness. With Renshi Scott, Renshi Aksell and Sensei Chris to name a few in the K2 instructor family, I’ve been receiving world-class instruction and leadership. During my training, I still find it tough to remember all the techniques, but my mental and muscle memory is getting better with practice. I’ve noticed a little age creeping in; my knees are not the greatest and I seem to have mild asthma. These are small things that nag at me but I try to not let them get in my way. After a particularly strenuous class, I feel great, knowing that I have pushed my personal envelope just a little bit more. I have no allusions about my future as a martial artist; I’m no budding Bruce Lee, but nor do I have any doubts about my current progress. I am improving. I’ve come to understand that the martial arts have become a valued part of my life, and one of my preferred ways of getting and keeping in shape. I’m not driven to reach a particular belt level where I can say I’m done, nor am I particulrily interested in competitions. Instead, I strive to steadfastly be the best I can be, and the K2 staff have been consistent in supporting my progression at a rate which I can sustain, in the ever-present balancing act between my work, my family and my health.